Nearly every professional has produced at least one resume in his or her quest for employment, but even the most experienced workers sometime stumble with the finer points of resume construction. The good news is that you can learn from the mistakes of others. Following are some real-life blunders that are made by applicants. You'll also find tips for avoiding these blunders. "I often use a laptop. "I will accept nothing less than $18 annually." In a recent survey, 84 percent of executives polled said it takes just one or two typographical errors in a resume to remove a candidate from consideration for a job opening. Hiring managers view your resume as an indication of your attention to detail, and a mistake will convince potential employers you lack it. So, after running your computer's spell-check function, ask a friend to review your application materials. "Interests: Running, editing video, cooking, writing and wondering." "Able to say the ABCs backward in under five seconds." 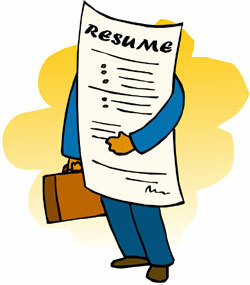 Hiring managers often have dozens of resumes to review and appreciate being able to scan them quickly. If you include unnecessary information -- such as your hobbies, marital status or personal trivia -- potential employers may simply bypass your application. Omit details that don't directly demonstrate how you can benefit the employer, and tailor each document to the specific company and position. "If U hire me, U will not have any regrets!" "I don't have a phone 4 the time being. Please email me instead." Remember that you're writing a professional document to be read by a prospective employer, not dashing off a quick email or text message to a friend. Hiring managers will use your resume to gauge your level of professionalism, so steer clear of informal language, unconventional acronyms and emoticons. Before you hit the send button, check to make sure you've attached the correct document. For example, one candidate sent an e-mail addressed to a competing firm. Another applicant submitted a fact sheet about California's population instead of his resume. Also check the labels you give the documents. Files with generic or informal names can get lost on a hiring manager's hard drive or cause a prospective employer to doubt your professionalism. Using your full name as a label is much better than "Oh Boy.doc" or "Hey there.doc" -- both real examples, by the way. Last but not least, it's best to forego smoke and mirrors. You don't want to leave hiring managers scratching their heads, like the following applicant surely did: "I am a wedge with a sponge taped to it. My purpose is to wedge myself into someone's door to absorb as much as possible."